I briefly considered opening this post with a paragraph-long deprecation of Valentine’s Day, but I did something along those lines last year, so why do it again? Instead, this year, I’m going to talk about what I do like about this ingeniously marketed holiday. I’m sure it’s rather straightforward and plain considering my interests and my gender. But not too simple; of course I like flowers and the occasional piece of chocolate, but those are great all year, so I’m not going to credit Valentine’s Day with their presence, existence or current prevalence. But the girly color scheme? Heck yeah – I’m all over that. Poorly represented in my wardrobe, the repressed and unloved pinks, reds and whites lacing supermarket displays January through mid February inspire a decidedly feminine and dainty quality in my baking ventures. Powered by pink and roused by red, I’ve got so many Valentine’s themed desserts spinning around my head and stored in the memory bank of my cell phone’s notepad app that it’s not even funny. I’m sad to admit that I probably won’t be able to execute or share everything I’m hoping to, but that’s why I’m starting early. Maybe, just maybe, I’ll be able to share more than one treat a week in the coming weeks. I can’t promise it, but I’m certainly hoping for it. Anyway, when Mr. P (not to be confused with my P) of Delicious, Delicious, Delicious told the world that he was doing over a week’s worth of Lamington reinvention in the days leading up to Australia Day, I was thrilled that the fluffy white coconut fit right into the color palette over which I’m currently obsessing. 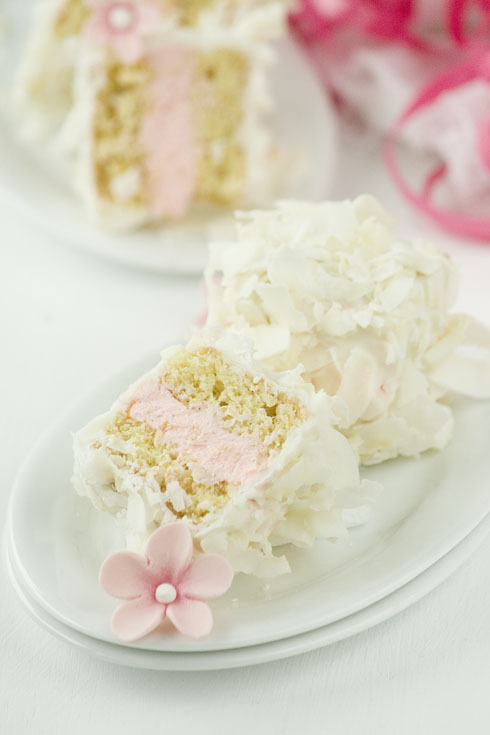 So, not only do I get the pleasure of participating in Reinventing the Lamington 2011 with this recipe, but I also get the chance to excusably indulge in a little pink-and-white-super-kawaii-frill for once. Which is always good, if you ask me. Grease, line and re-grease an 8″ x 8″ pan. Combine the ground almonds and flour in a small bowl. Set aside. Combine egg yolks and 1/4 c sugar in a double boiler, and whisk constantly until tripled in volume. 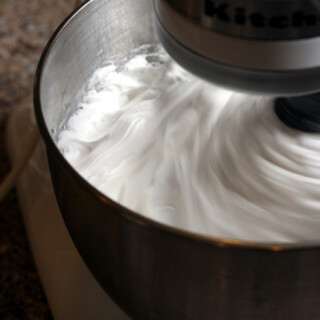 Meanwhile, in another bowl, whisk the egg whites until they just start to peak, then gradually sprinkle in the sugar. Beat until soft peaks form. 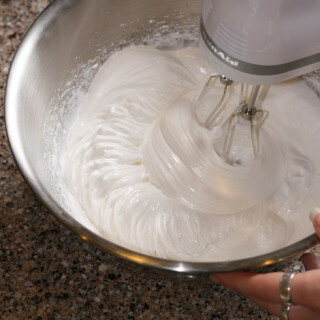 Gently fold the egg whites into the yolk mixture. Fold in the dry ingredients and the butter. 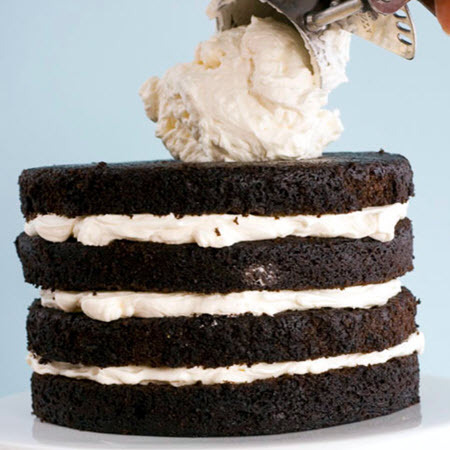 Pour into your prepared pan and bake 10-15 minutes until the cake is lightly browned and springs back when pressed lightly. Beat the butter until slightly lightened, then add the salt and powdered sugar. Beat until light and fluffy, then add the maraschino cherry juice and vanilla. Beat to combine. 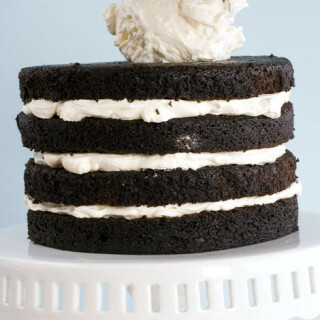 Cut the cooled cake into a 6″ x 6″ square. 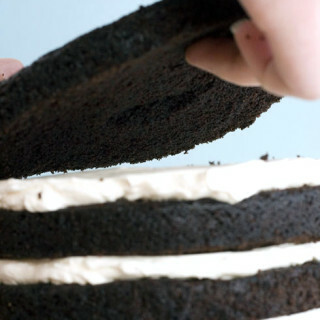 Cut that cake into two 3″ x 6″ halves and set one layer aside. 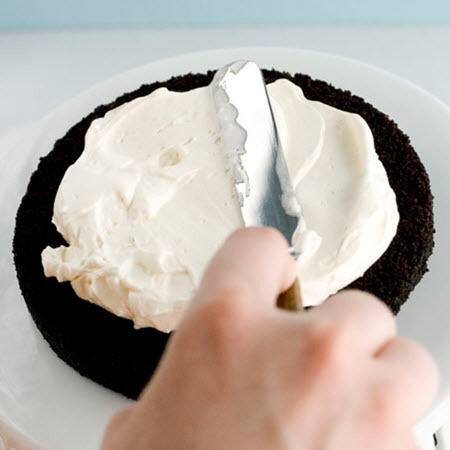 Spread and smooth the frosting over one half of the cake, then top with the other, smoothing the frosting along the edges. 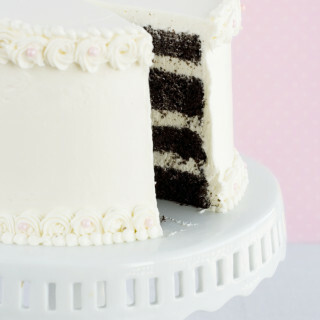 Chill overnight, if possible, then cut the cake in half lengthwise, resulting in two 6″ x 1.5″ rectangles. Cut each of these strips into 4 pieces and you will end up with eight 1.5″ x 1.5″ x 1.5″ cubes. 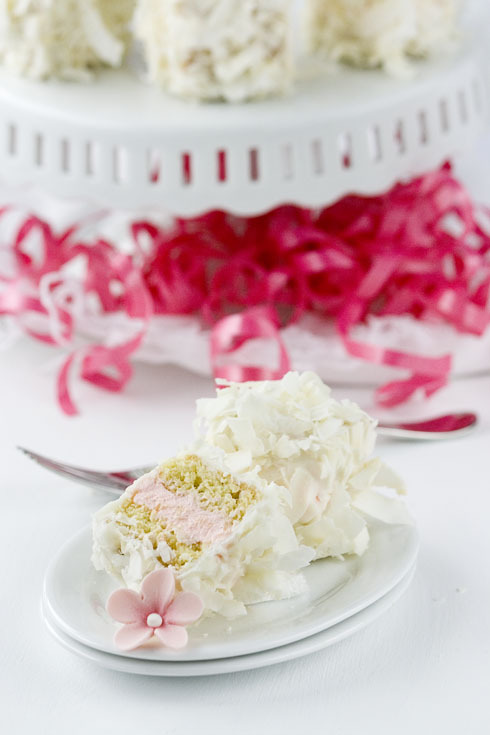 Place the mini cakes on a plate or baking sheet and return to the refrigerator. 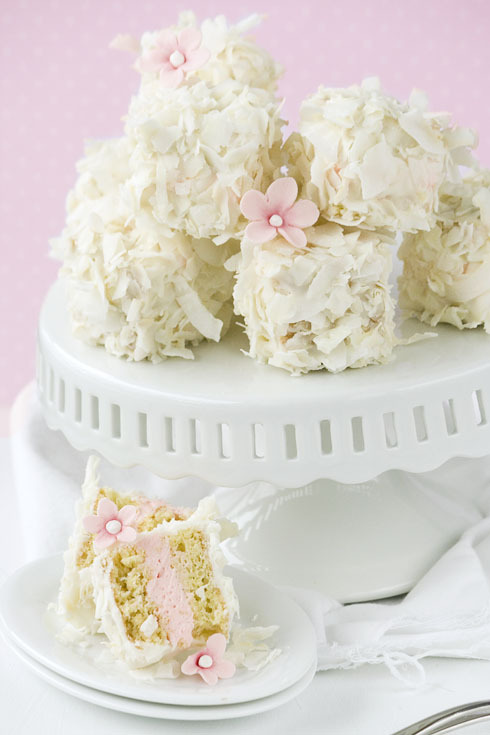 Place the coconut in a bowl and set out a sheet of parchment paper or a plate to hold your coated Lamingtons. Melt the chocolate either in the microwave or in a double boiler – whatever makes you most comfortable! To make coating the Lamingtons easier, transfer the melted chocolate to a tall thin container. Dip each chilled and naked Lamington using a fork or a pair of chopsticks (whatever works for you!) to support it. 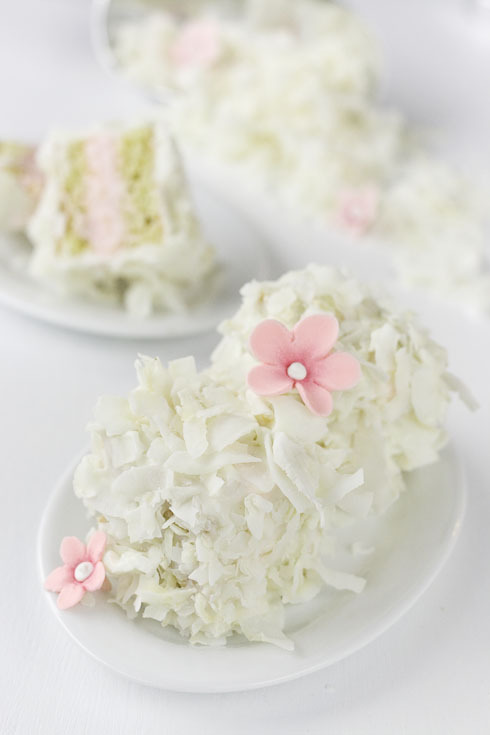 Tap your dipping device on the edge of the bowl to slightly thin the coating and immediately roll the Lamington in the shredded coconut to coat. Let set/harden on parchment paper or plate. So pretty! And I&#39;ll bet they&#39;re delicious, too. I can&#39;t wait to see what everyone has submitted for the contest! :o)<br /><br />Also, your pictures are always so gorgeous…do you have a trick to getting the lighting just right? What kind of camera do you use? Beautiful!! 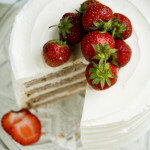 I&#39;ve been loving the lamingtons on Mr. P&#39;s blog as well. Yours are so lovely! <b>@Diana</b>: Thank you! I&#39;m looking forward to seeing the entries, too! I just shoot on the floor next to a sliding glass door and use a Canon Digital Rebel XTI. No tricks except for a white foam board covered in aluminum foil which I use to bounce light back into the set-up. <br /><br /><b>@Julie</b>: Thanks so much! Amazing looking lamingtons! 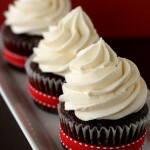 They look so good, and very delicious!! Kawaii! Love your pictures! Especially the color scheme! I love these, they&#39;re adorable! So, like, I&#39;m sure people ask you this all the time, but… have you considered baking as a career? Or will it always be banished to the ghetto of hobby? Because these are beautiful. Everything you make is beautiful. These are just SOOOOOOOOOOOo gorgeous!!! 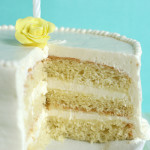 Kaitlin, I like your photos, especially the white-on-white cake with pink flowers. There is a sublime delicacy in your visual sense. 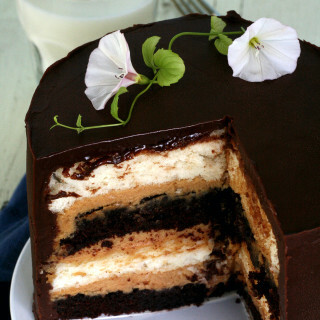 That looks way too pretty to be eaten 😉 Gorgeous photos!! Just absolutely gorgeous. 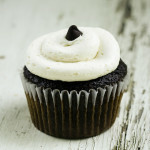 I love the elegance &amp; &#39;feminity&#39; of this treat! You&#39;ve got a winner here Kaitlin, you do. I love the idea of cherry lamingtons. I&#39;ve only tried them once, but have been jonesing to try some again soon. Your beauties would be first on my list. Gorgeous photos too! Beautiful job! I had lots of fun with Mr. P&#39;s challenge too! Love your blog. These are so beautiful! If they taste even half as good as they look, oh my . . .
Ah ha, maraschino cherry juice, after scoffing all the cherries that&#39;s what I should do with the juice, brilliant. 🙂 Look really pretty. Lovely photography too. These are gorgeous lamingtons! I&#39;m a total sucker for white/pink color schemes and maraschino cherries. I&#39;m totally tempted to try this out; they sound really good. I absolutely love these! They look awesome!! oh my god these images! im gonna forever be a fan of yours because of these images! i found them on pinterest and i traced them back through 15 websites to you! and it was altogether worth it! awesome work. This recipe sounds as good as it looks! I&#39;ve tried making the cake twice today and it doesn&#39;t turn out -any ideas why not? It looks like its sitting in a pool of liquid, and it barely rises at all…I would love any tips or suggestions you have! Third times a charm! I don&#39;t know what I did differently this time but it worked! They aren&#39;t as fluffy and beautiful as yours but they are delicious 🙂 Thanks!